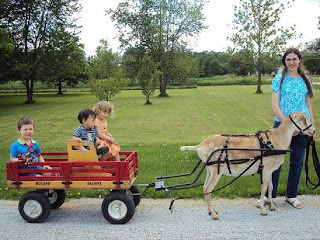 Amish Wagon Works: Dog or Goat Shafts for Your Wagon! Dog or Goat Shafts for Your Wagon! With Valley Road or Speedway Express Wagon Dog or Goat Shafts, you can bring your four-legged friends into the fun! These American-made shafts will easily convert your kid's wagon from a standard pull wagon to a carriage or stagecoach for an afternoon's fun. If you have large dog that loves to play with the kids, why not teach it how to pull them? Or what about that large, friendly goat that spends too much time eating and not enough time exercising? Goats are easy to train to pull wagons--I know, I've trained them! ﻿﻿ We have discovered that a wagon-pulling goat makes a wonderful addition to parades, children's parties, and wedding receptions﻿﻿. And they are just fun to have around! Your children and their friends will be thrilled when they are pulled for the first time by their favorite dog or goat. Pair with the Speedway Express--Conestoga Cover for your own "goat-drawn" covered wagon! ﻿﻿ Shafts on a wagon are also useful when you need to haul wood or anything else. Your dog or goat can be hitched up to the wagon, and make your task that much easier! Goats especially are strong--you will be surprised at how much they can handle and how willingly they will work. Why not invest in shafts for you Speedway Express or Valley Road Wagon today? The memories are there for the making! Roller Racers for Rolling Races! Timeless Favorite for Your Favorite Child!